My name is Karen Jiles. I am a wife to a wonderful husband and mother to beautiful twin girls. We currently reside in North Carolina, where I am a Mixed Media Artist and Scrapbooker. I began my love of crafting years ago as a child. It was just something about creating with my hands that had me intrigued and inspired to continue creating on into adulthood. I have been stamping for 17 years, scrapbooking for 15 and creating mixed media pieces for 10. My love for all 3 has enabled me to share my talents with family and friends. I also enjoy creating cards, mini albums, altered items, keepsakes, journals and jewelry. I can be found in my craft room every evening enjoying what I truly love and am very passionate about. Karen, I love love your creations. You will be an inspiration in our work together as a DT. Welcome. Thanks so much, Veronica!! I’m looking forward to it! 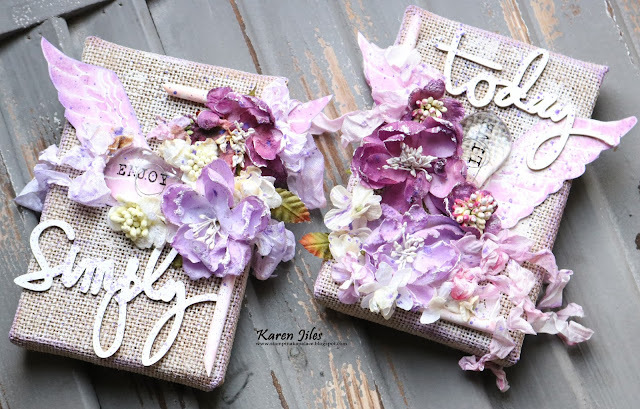 Love your creations Karen!! Welcome!